More than 55 million impressions will be delivered via billboards and in-transit displays, as well as 3.5 million digital and social media impressions around Chicago along with more than 2.4 million impressions through 30-second radio spots airing on local stations. Chicagoland was chosen for this special campaign by ATF. No taxpayer dollars are used. The program is funded in full by the firearms industry. “As evidenced today, the firearms industry is proud of its longstanding cooperative relationship with the ATF and the entire law enforcement community by assisting them in their efforts to combat the criminal acquisition and misuse of firearms,” said NSSF Lawrence G. Keane, NSSF senior vice president and general counsel. “Don’t Lie” is a cooperative program ATF and NSSF, the trade association for the firearms and ammunition industry. The effort was developed more than a decade ago to raise public awareness about the seriousness of the crime of purchasing a firearm for someone who cannot legally do so. The program also helps ATF educate firearms dealers so they can be better prepared to deter potential straw purchases. The public campaign drives home the message that anyone attempting an illegal firearm purchase faces a stiff federal felony penalty of up to 10 years in jail or up to $250,000 in fines. To legally purchase a firearm, a person must be able to pass an FBI National Instant Criminal Background Check and fully comply with state and local laws, including Illinois’ requirement for a Firearms Owners Identification Card. When a criminal knows he cannot pass this check, he may try to induce a friend or other person to make the purchase on his behalf, which is known as a straw purchase and is a felony. 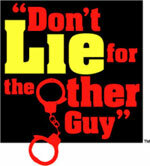 Learn more about Don’t Lie for the Other Guy at www.dontlie.org.